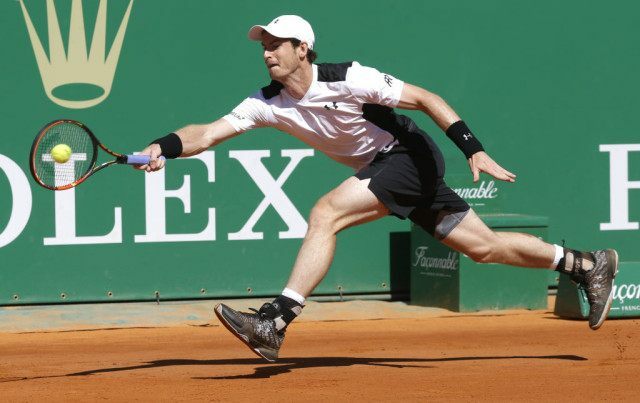 MONACO (AP) — Eight-time champion Rafael Nadal saved 15 of 17 break points, and Andy Murray rallied from a set and 3-0 down as both advanced to the Monte Carlo Masters quarterfinals on Thursday. Nadal scampered around the clay to retrieve forehands from Dominic Thiem and beat the Austrian 7-5, 6-3. Murray came back to defeat an erratic Benoit Paire of France 2-6, 7-5, 7-5. Roger Federer had little trouble by comparison, beating Roberto Bautista Agut of Spain 6-2, 6-4 as he came through his second match unscathed after arthroscopic surgery on Feb. 3 for torn cartilage. Nadal, arguably the greatest clay-court player in history, struggled in the first set against Thiem, facing 16 of the 17 break points. At 4-4, and with each player having dropped serve once, Thiem missed six chances to break Nadal. On the last one, Thiem let a lob go thinking it was going out, and watched it land in. The Spaniard clenched his fist after holding that tough game, and then broke Thiem when the Austrian double-faulted on set point. After Thiem broke Nadal to love in the third game of the second set for a 2-1 lead, Nadal quickly regained momentum and broke Thiem two more times to set up a quarterfinal against Stan Wawrinka, the 2014 champion. Murray had an even closer match, but he also managed to reach the quarterfinals, winning 19 of 29 points at the net. Paire had 47 winners among a number of eye-catching shots, but the Frenchman also made 52 unforced errors. He had eight aces and seven double-faults. Paire also lost his composure at key moments, double-faulting when serving for the match and again on match point. Murray next plays Milos Raonic of Canada, who had 12 aces in beating 99th-ranked Damir Dzumhur of Bosnia and Herzegovina 6-3, 4-6, 7-6 (5). Wawrinka advanced by routing Gilles Simon 6-1, 6-2, breaking the Frenchman’s serve five times. Since losing his first 12 matches against Nadal, Wawrinka has won three of their past five encounters, including the final of the 2014 Australian Open, his first major. The day after beating Djokovic in the second round for the biggest win of his career, 55th-ranked Jiri Vesely of the Czech Republic lost to Gael Monfils 6-1, 6-2.